Ulriken is one of the seven mountains surrounding Bergen, and it’s the highest. It’s very close to Bergen Sentrum so you don’t have to travel very far to get to its base. Many hikers have conquered this Norwegian mountain on foot but we went up by cable car this time because we decided to go pretty late in the day. Also, I’m still only acclimatising to Norwegian weather. It was a much colder day than the 2 days prior and I had not prepared the appropriate gear. Preparation is key! I’m told many people tend to find themselves freezing atop these Mountains of Norway and wind up having an air ambulance pick them up. No ma’am, I am not going to join that league of extraordinary unfortunate beings. Up we went in Ulriken’s cable car, Ulriksbanen, either Brunes or the other whose name I forget(!) that are named after children’s characters. The views as we went up were amazing. 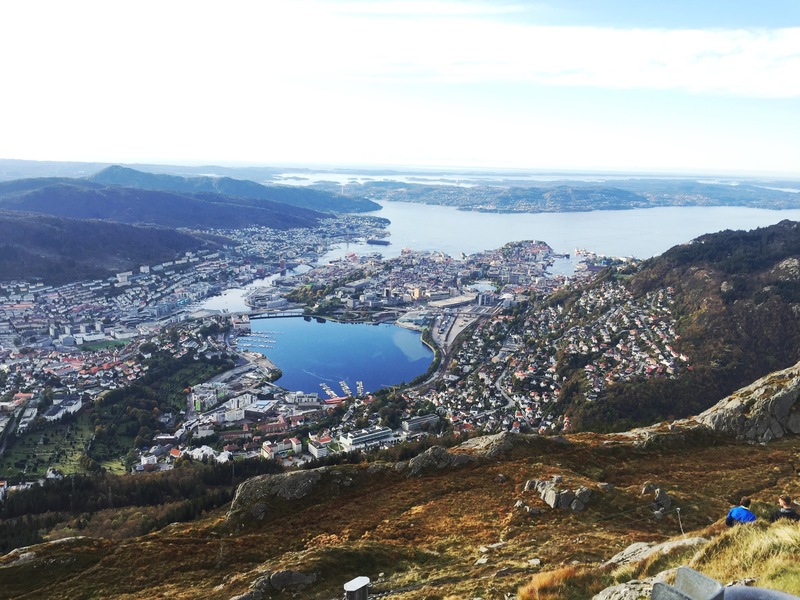 They only just get better once you get to the top, and get a panoramic view of beautiful Bergen to one side, and firm, looming green-grey mountains on the other. The view at Ulriken that was not so impressive was the never-ending line of people that were queuing up to ride back down to the base of the mountain. We had no intention of hiking down the mountain, not because it was very tough but mostly because as night drew close the temperature dropped even lower. Ulriken tip: expect a very long queue back down and plan accordingly. You can have a snack or dine at a the rather confusing combination of diner/restaurant that they have going on up there. The 2 sections are divided by a curtain. The section I’m referring to as a diner must have been meant for rough and tough grab-a-quick-bite style hikers, I’m not sure. It seems a bit neglected. The ‘restaurant section’ was well laid out with table clothes and silverware and what not, and turned out to be fully booked so we decided to go eat elsewhere. We had tried calling ahead to book a table but no one was answering the phone. That dividing curtain is what really did me in though. It was this way it looked like it was meant to separate the haves from the have-nots. Perhaps all the restaurant had wanted to do is maintain an elegant looking area for those of their clientele that want an elegant dining experience. However by keeping the less elegant ‘diner section’ so tardy, what they achieved instead with that limp-hanging curtain is a touch of tacky. Do I seem to be going about this forever? I don’t know, may be I was just hungry and cranky. The ‘diner section’ did nothing for our appetite, Ian was especially underwhelmed, so we had what looked like a pancake and a cup of tea (which we waited unnecessarily long for because of another Wall of China style queue), took some pics against the gorgeous views and went back to join what was now a somewhat shorter queue. The best part of Ulriken for me was the trip up and down. I would go back up there just to enjoy the view. We talked about hiking up there one day soon, probably after we move into our new apartment. Note to self: weather will be freezing around that time, best make that super underwear shopping trip soon! 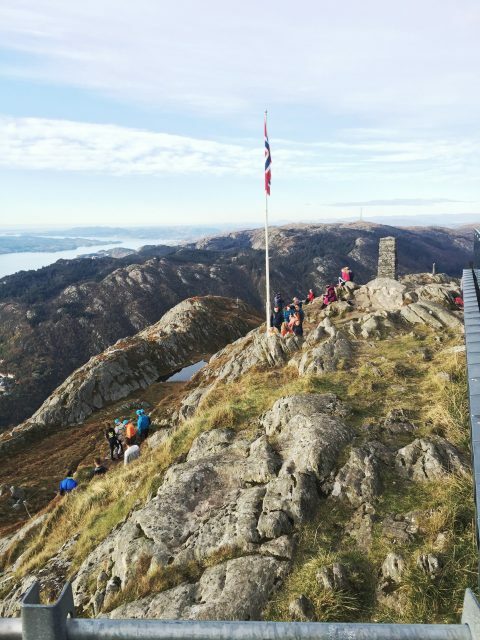 From Ulriken you can actually hike to some neighbouring mountains like Fløyen, or go do some sky sports. Overall, I had a lovely time up at Ulriken. Yes, in spite of that paragraph that’s emoting about the restaurant’s have/have-nots curtain, I enjoyed being up at Ulriken.